The Elder Scrolls Online: Elsweyr is coming to PC/Mac, Xbox One, and PlayStation®4 on June 4, and it is now available for pre-purchase. Find out which version of ESO’s latest Chapter is best for you! Elsweyr is now available for pre-purchase on relevant digital platforms and storefronts, including the ESO Store, Steam, PlayStation®Store, and Microsoft Store. You can view and select your desired pre-purchase version, platform, and retailer on our Buy Now page. The game will launch on all platforms on June 4, but the digital PC/Mac version of the game will enter Early Access on May 20. The Elder Scrolls Online: Elsweyr Standard Edition will be available in physical stores at launch on June 4 – check your local retailers for details. Noble Clan Chief costume - The clans of Anequina in northern Elsweyr are largely nomadic, but they nonetheless have hereditary aristocracies who express their wealth and power through the splendor of their clothing. Blue Dragon Imp pet - A clever Illusion Imp that's found a way to get free handouts and a warm place to sleep. 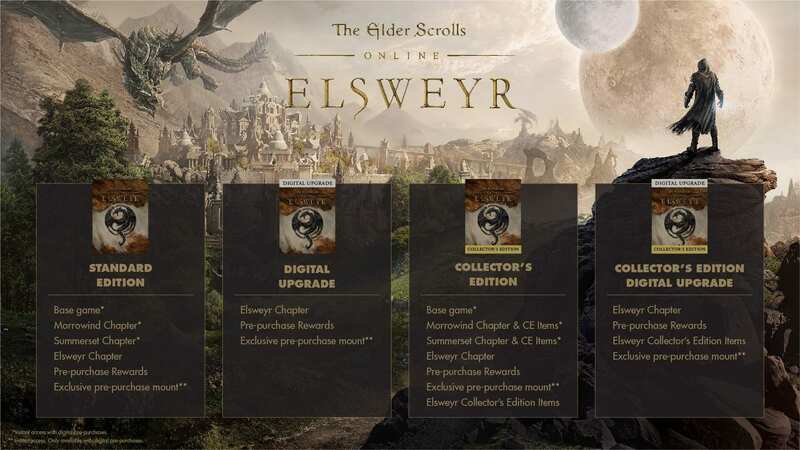 In addition to the above, digital pre-purchases of the full Elsweyr Collector’s Edition and Standard Edition (not Upgrades) provides immediate access to ESO base game, Morrowind Chapter, and Summerset Chapter. The Collector’s Edition will also include the Collector’s Edition items for each Chapter, too. Note that these editions will continue to include Morrowind and Summerset post-launch, but the only way to get immediate access before launch is by digitally pre-purchasing them. Finally, all digital pre-purchases will also receive immediate access to an otherworldly in-game steed: the Rahd-m’Athra mount. 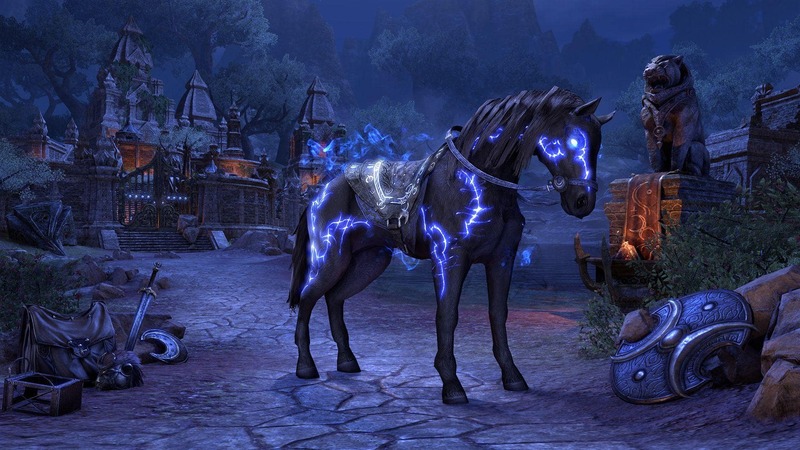 Physical pre-orders of Elsweyr will still receive the Rahd-m’Athra mount reward, but not until the game launches on June 4. Get instant access to the Rahd-m’Athra mount with digital pre-purchase! Whether you’re an existing player or a newcomer, there’s a version of Elsweyr that’s perfect for you. Check out the below infographic and information on the unique editions for everything you need to know! Senche-raht mount - Largest of all the furstocks, or "breeds" of Khajiit, the Senche-raht is fully intelligent, and in combat often serves simultaneously as warrior and mount. Ashen Scar Jerboa pet - There are many in the Ashen Scar, and if you catch one when it's small, it makes for a pleasant, fuzzy friend. Archaic Lore Tablets memento - Invoke these Tablets of Archaic Lore and they glow with the wisdom of ancient knowledge! Khajiiti Culture Emote Pack - Cat-Folk Pack that includes the Cat Contemplation, Feline Hygiene, and Pedlar Beckoning emotes. Dragonbone Outfit Style - Allows you to convert your gear to the Dragonbone style. 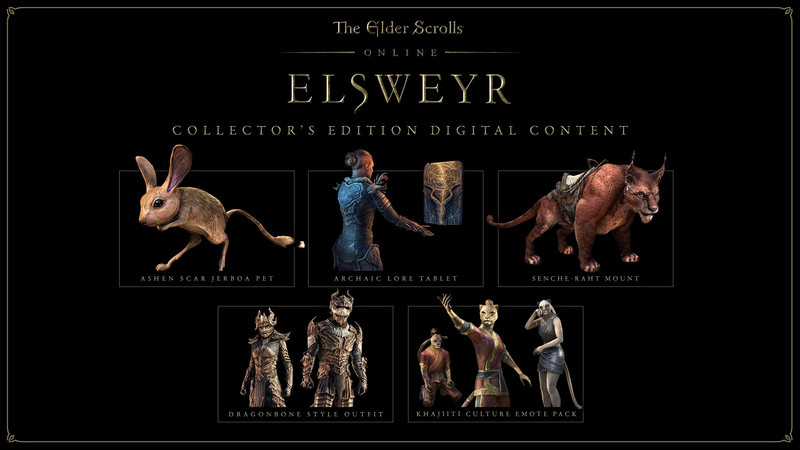 The Elsweyr Collector’s Edition is available digitally only. 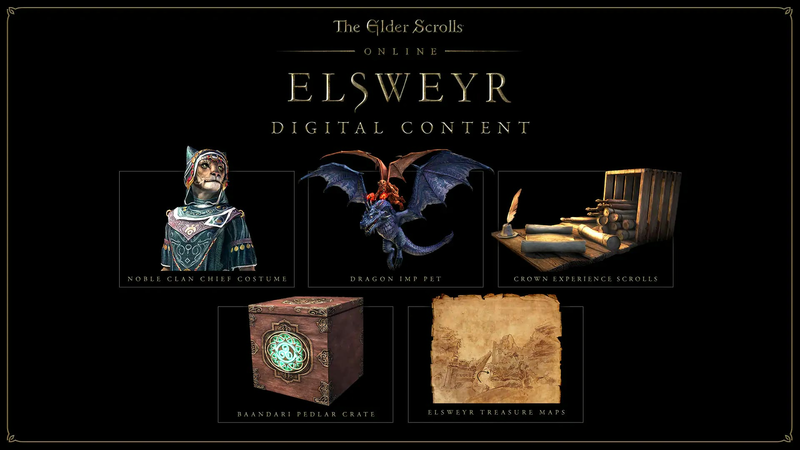 When pre-purchasing the Collector’s Edition, you’ll get immediate access to the ESO base game, the Morrowind and Summerset Chapter, and their associated Collector’s Edition items (the Elsweyr Chapter and it’s CE items will be available at launch), allowing you to get a head-start on your adventures in Tamriel! Pre-purchases of the Collector’s Edition will also receive all the digital items included in the pre-purchase section at launch, plus immediate access to the Rahd-m’Athra in-game mount. The Elsweyr Collector’s Edition Upgrade is available digitally only. Pre-purchases of the Elsweyr Collector’s Edition Upgrade will also receive all the digital items included in the pre-purchase section, including immediate access to the Rahd-m’Athra in-game mount. If you’re a new player, the Elsweyr Standard Edition includes access to the ESO base game, Morrowind Chapter, Summerset Chapter, and Elsweyr Chapter. It is available for pre-purchase digitally now and in physical format at launch – check your local retailers. Pre-purchases will also receive all the items included in the pre-purchase section at launch, plus immediate access to the Rahd-m’Athra in-game mount (digital pre-purchases only). When pre-purchasing the Standard Edition digitally, you’ll enjoy immediate access to the ESO base game, Morrowind Chapter, and Summerset Chapter. Existing ESO players can also get access to the new Chapter by picking up The Elder Scrolls Online: Elsweyr Upgrade. This version includes the Elsweyr Chapter, and it is only available digitally. Pre-purchases will also receive all the digital items included in the pre-purchase section at launch, plus immediate access to the Rahd-m’Athra in-game mount. The Elder Scrolls Online: Elsweyr is coming soon for PC/Mac, Xbox One, and PlayStation®4, but you can get immediate access to the game AND ride in style upon the amazing the Rahd-m’Athra mount if you pre-purchase today. Are you excited to visit the home of the Khajiit? Let us know which edition of Elsweyr you’ll be picking up on Twitter @TESOnline, Facebook, and Instagram using the #SeasonOfTheDragon hashtag!